So in Auckland [listed company] Contact [Energy] is cheaper than the three SOEs. The total opposite to what Goff claimed. They are in fact $178 cheaper than the most expensive SOE, not $500 more expensive… [In] Christchurch … Contact is cheaper than two of the SOEs. … In Wellington they are more expensive, but by only $13 to $148. … [In] Dunedin … Contact is cheaper than two of the SOEs. On the face of it, that seems to be an argument that a listed privatised company delivers domestic electricity supply as cheaply or cheaper than the SOEs do. But what Farrar has done is cherry-pick only the November 2011 statistics from the Consumer Powerswitch website. 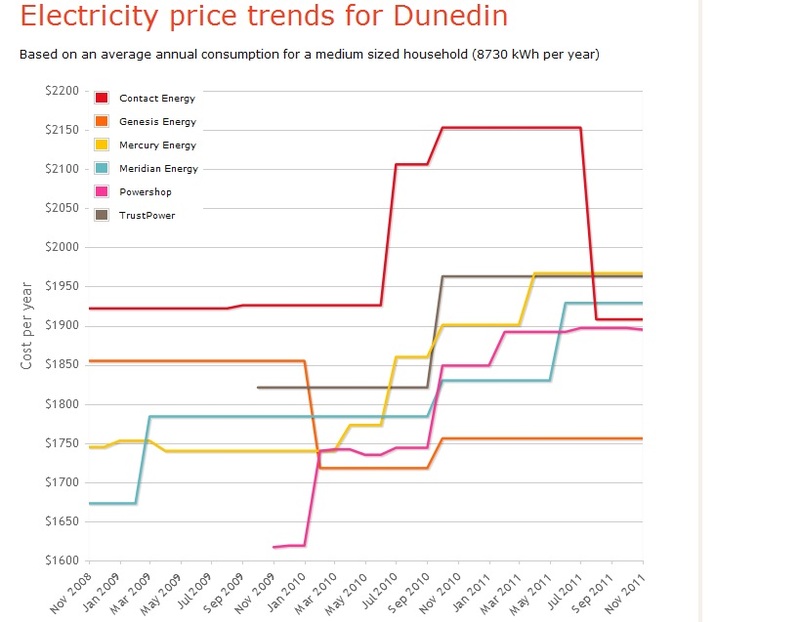 Contact actually had substantially higher prices in Dunedin than any of the SOEs for the entire period between November 2008 and August 2011. It has been only the last four months that it has been (slightly) cheaper than Meridian and Mercury, but still significantly more expensive than Genesis. Similarly, in Auckland, Contact was more expensive than any of the three SOEs between July 2010 & July 2011. In Wellington, Contact was most expensive between November 2008 and November 2011– the entirety of the last 3 years. And in Christchurch, Contact was most expensive between March 2011 and July 2011. Farrar also fails to take into account the pricing of Contact’s 100% owned subsidiary, Empower, which where it provides retail electricity supply has significantly higher prices than any of the three SOEs for the entire three year period (see links to Auckland, Wellington, and Christchurch prices above). Farrar might be right to call out Goff on the $500 annual price differential he claims between Contact and the SOEs – that figure seems to me to have been either exaggerated or cherry-picked. But to dogwhistle that privatisation will bring lower electricity prices is simply not supported by the evidence. Incidentally, I’m somewhat suspicious about the sudden and dramatic drop in Contact’s domestic electricity prices from August 2011, just after National’s SOE privatisation announcement. I’m wondering if this is a loss-leading exercise to gain market share before the SOEs are privatised. National, having campaigned on not selling off or privatising state assets in its first term, has now moved its prisons policy from case-by case private management to full-blown private management for every prison. Here’s a hint, National: Putting prisons under private management is still privatisation even if you don’t sell them, and you knew the public simply did not want privatisation right now. Putting something off the table means you need reasonably robust plans for not doing it. Clearly your plans were not robust. This is of course ignoring the fact that National is trying to salvage the disaster that was Labour’s softer version of their own vengeance-based incarceration program. But even just breaking their most crucial election promise is enough to make this move all sorts of stupid. Over the weekend Green Co-Leader Russel Norman uncovered an obscure Cabinet paper (PDF) that I suspect Local Government Minister Rodney Hide would have liked to slip by without public attention. 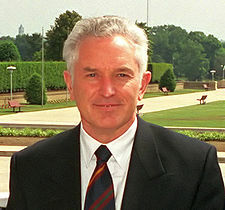 I propose to link the second Government priority area – reduce bureaucracy and focus on frontline services – with the concerns I have about growth in rates and council funding decisions… While there is no formal definition of core services for local government, I would expect there to be general acceptance that it includes transport services (roading, footpaths, public transport); water services (water supply, sewage treatment, stormwater and flood protection); and public health and safety services (refuse collection and regulation of nuisances). Um, what about parks, libraries, community services, galleries, theatres, recreational facilities, leisure and cultural activities Rodney? Or don’t they count in the narrow world of the Act Party? [Transparency and accountability mechanisms] also include the requirement to consult the public on some decisions – notably decisions to contract major council services to the private sector or to sell shares in a port or airport company. The transparency principle has resulted in much more information being disclosed, but arguably without sufficient attention being paid to its relevance or usefulness. Translation: Contracting out services and selling assets are too important to consult the public about, because they probably won’t agree. that consultation processes are unduly increasing the influence of pressure groups. Translation: The wrong people are making too many submissions because the majority of submissions oppose my agenda. Community groups that have come together over local issues must have their influence reduced, because there is a “silent majority” that I’m confident really backs cutting and/or contracting out and/or privatisation of local government services (even though the Act Party got only 3.65% of the vote at the last General Election and was the only Parliamentary party that campaigned on these policies). I do not propose to publish a public discussion document… Once legislation is introduced into the House, the public will be able to comment during the select committee stage. However, I intend to undertake some targeted consultation with specific local government and non-local government stakeholders once proposal are developed. Translation: So I’m asking Cabinet to let me ram it through with as little public consultation as possible, but I will talk with a few of my mates in big business so it looks good and I can rely on them to put out supportive media statements if this all looks like turning to crap. This is the Margaret Thatcher/ Roger Douglas modus operandi all over again. Consult people as little as possible and silence the opposing voices to your programme. Ram legislation through Parliament as quickly as possible, in the hope that it will be a done deal before most people realise what is happening. We’ve been Rogered once by the bulldozer of the far right. It’s happening again, and it’s time for us to all stand up and fight it with whatever means we have available. …competition would bring electricity prices for the consumer down. Well, it hadn’t by 1999 and, as the Commerce Commission has found, it still hasn’t. Electricity consumers have been ripped off to the extent of $4.3 billion since Bradford’s reforms came into effect according to the research conducted by Professor Frank Wolak of Stanford University for the Commission. What’s worse is that according to the Commerce Commission it has all been perfectly legal. The Max Bradford solution was to split the old Electricity Corporation up into four corporate entities to force them to act competitively. They privatised one of them, Contact Energy, in 1999. Fortunately, National lost office before they managed to hock off the other three, Meridian Energy, Genesis Energy and Mighty River Power. The competitive model has been shown to be a miserable failure. So what’s the current Minister of Energy Gerry Brownlee’s solution? Mr Brownlee said that the Government was prepared to make big changes to the electricity industry to stop massive price rises. That included examining the market model introduced in the late 1990s by the former National government and the possibility of breaking up big state-owned retailer-generators such as Meridian and Genesis, he said. He doesn’t go as far as using the “P-word” that National Ministers have been prohibited from saying, but it’s pretty clear that he’s thinking about breaking up and privatising the state-owned electricity generating companies, which is really just finishing Max Bradford’s unfinished business. At least with three of the big generation companies in state ownership, much of the ill-gotten profits remain in New Zealand in the Government coffers. With what Brownlee is hinting at, the profits would head off overseas to the shareholders of big energy corporates. Eddie over at The Standard has a different idea. Buy back Contact (work out a fair share price and do it through legislation). Put the whole thing back into one and set it some simple goals: reliable supply at a steady, low price and phasing out fossil fuels. Don’t have an accident if National leads the next government! Now, I know that sems a weird thing to say, but you will need to be ultra-cautious if there is a National-led governemnt, becasue their policy will mean you will likely be declined ACC cover and either have to battle them through the courts or foot the treatment and rehabilitation bills yourself. I say this as someone with considerable experience in this area. For much of the 1990s and the first three years of this decade I worked as an advocate for ACC claimants, representing them at reviews and District Court appeals. Now ACC staff have, since the early 1990s, had the “my job is to save the Corporation money” ethic instilled into them. Hence there are lots of decisions that are wrong in law, although it has gradually improved over the last 8 years. But from my experience of working as an ACC claimant advocate, the time accident compensation plumbed the depths of malfeasance was during the brief period 1999-2000 when the last National Government privatised workplace accident insurance. There are two ways that private insurers can minimise cost and deliver a return to their shareholders. The first is to engage in injury prevention. That is expensive. The second is to deliberately and maliciously decline claims that are valid. That is what the private insurers did in the 1999-2000 period, and I witnessed it first-hand as an advocate for claimants over that time. The private insurers work on the basis that ACC review and appeal soxts are so minimal that most lawyers and advocates won’t work on a contingency basis, however valid the claim. And the law is so complex that most claimants don’t have the expertise to represent themselves. So the private insurers falsely and maliciously decline claims in the knowledge that most claimants will not have the resources to challenge the decisions. If they wrongly decline 10 claims, and only two have the persistance or resources to challenge them legally, then that is a bloody good deal for the private insurers and their shareholders. Steve Pierson has blogged about this here earlier today at The Standard. I think he is spot on, and I have the experience working in the area to give credibility to his claims. If National lead the next government, be very, very afraid of having an accident.